I live way up on the North Side, but the fellow I'm seeing lives in the West Loop, and I didn't realize until last Saturday night how close he lives to Taylor St. (we went to Hawkeye's to watch the Red Sox and have some chili and a couple of beers, and it took maybe five minutes to get there from his house). Oddly, even though he loves good Italian food, he's never really explored it at all, and it seems that it's high time he did (and by proxy, me, too). What should we try first? And second? And third? He's a low-key person who's not much for dressing up - and neither am I, truth be told. Please share what you like best, so that I can share with him. Gennaro's-Italian family basement style dining replete with wicker bottles of chianti and wood paneling. Their red sauce is some of the best in the city. Calamari served fresh with lemon and herbs is clean, fresh, and crispy without being overcooked. Chez Joel is also a decent bistro. Great Bouillabaisse. They do it all in postage stamp of a kitchen. Very warm service. Other favorites: Al's Beef of course. Taj Mahal-This guy can cook. The only problem is their business sense is a bit off. Half the time they are out of one of the curries or samosa's. I mean how can you run an Indian establishment and run out of samosa's. Irrespective, the lamb and chicken curries are melt in your mouth osso bucco style falling of the bone preparations. There veggie options Dal and Chana Masala tend to run very spicy. Finally, a small place named Couscous has solid middle eastern. Tasty lamb Schwarma (though maybe not as good as Steve's on the southside). Falafel with Jerusalem salad is good. The hummous is garlicky, lemony, with just a touch of paprika. The tabbouleh is super fresh and herby with lots of fresh cut parsley and mint. Finally I love their turkish coffee full of cardamom. Thanks! That's a very nice cross-section of tastes. I'll report back as we explore. I really like RoSal's, in the more eastern section of Taylor street - I've always had good experience there. I'm not particularly a fan of the Rosebud there (friend found shards of glass in her salad there ?!). I like Coucous too - slow service, but tasty food. Taj Mahal is pretty good but little atmosphere. I find better food on Devon, but it is reliable. There is also a hard to spot little lunch place in the UIC school of public health? west of Ashland. It is called Pomme and is owned by the sweet maple cafe people (also a very good place for breakfast or lunch). They have good sandwiches. For more selection, I'd head to Sweet Maple. Both are good. Definitely try RoSal's, but you'll generally need reservations. Happy Thai is also pretty reliable Thai food. Fun, easy going place to hang out. (no dressing up required )All kinds of drinks, not just wine. They have live music on the weekends I believe. I'm not exactly too familiar with Little Italy myself and from other folks I know, Taylor St. is the highlight of Little Italy (is that true?). If there is a more suitable place within little italy, that would be great too. Any of your other recs in addition to what was previously mentioned would be greatly appreciated. Thank you in advance! foodie1 wrote: I'm not exactly too familiar with Little Italy myself and from other folks I know, Taylor St. is the highlight of Little Italy (is that true?). If there is a more suitable place within little italy, that would be great too. Any of your other recs in addition to what was previously mentioned would be greatly appreciated. Thank you in advance! Also Tufano's on Vernon Park (off of Racine) and Café La Scala (?) on Racine a block south of Harrison. I might be forgetting some but that should be a start for further searching. I've eaten at a few of these places but not lately. Bacchanalia is still open (I just called); I enjoyed my meal there last February, though I have heard a few negatives about the place voiced on this board. Ate at Ignotz a few weeks ago -- dismal, mediocre, not worthy. A, isn't the Oakley area also called, oddly, "Heart of Italy"? The name "Little Tuscany" would also apply, as it's largely northern Italians there (or, at least, there used to be). David Hammond wrote: Bacchanalia is still open (I just called); I enjoyed my meal there last February, though I have heard a few negatives about the place voiced on this board. I have some friends who live down in that neighbourhood and know the owner of Ignotz' well too. I had a very fine bowl of fettucine with tomatoes and seafood last summer at Ignotz' (with the noodles cooked properly to order witout any special request on my part) but haven't had any other main dishes. As I understand it, someone came up with that as a sort of marketing tool to combat the fact that the Taylor Street resaurateurs have started calling Taylor Street 'Little Italy'. In any event, the Oakley neighbourhood did (and to a degree does) have a number of Italian residents from Tuscany, as well as from points further north. Anyway, it's a very nice neighbourhood but it's quite small now. Last edited by Antonius on October 28th, 2011, 10:26 am, edited 1 time in total. Don't forget Little Sicily! Used to be the area bounded by Division street on the north, Chicago avenue on the south, Sedgwick street on the east, and Larrabee street on the west. Now the area on Grand west of the expressway until Ashland (and maybe a little further) is what I hear referred to as Little Sicily. Home of D'Amato's bakery and the grocery/deli next door whose name currently escapes me. Bari's name escapes you? The horror! Coupla things - no credit cards are accepted, nor checks, I assume, and it is NOT fancy (and take a cab! Parking is tough, especially on the weekends). But the food is great, everyone is friendly as can be, and it's true to its roots, as Alton Brown would say. gleam wrote: Bari's name escapes you? The horror! I know, I know. I prefer Caputo's italian sausage and deli, so I rarely go there even if it is 3 blocks away from where I live. sundevilpeg wrote: I have to chime in with a rec for Tufano's, AKA the Vernon Park Tap. I love Tufano's, been going for, hell, longer than I can remember. Most of what I love about the place is the lemon chicken, juicy flesh, crispy skin with charred edges and extra crisp cottage fries, luxuriating in a puddle of olive oil, garlic and lemon juice, with the potatoes on the bottom soaking up the olive oil and chicken juices. I'm also a fan of the fried calamari, broccoli and shells and Tufano's bread with a liberal application of giardiniera. Though really, it all boils, or should I say broils, down to the lemon chicken. Parking is not a problem, Tufano's valet is only $3. We hadn't been to the Oakley neighborhood in a long while and found ourselves with a craving, so I made a reservation at Bacchanalia for last night. A couple walked in right in front of us without a reservation and was sat at one of the tables against the wall. We were then sat at a table in the middle of the room with the only empty table in the place about 6" from ours. I was mildly annoyed because I knew someone would be sat there shortly, and sure enough, a few minutes later a couple was. Not a huge deal, but I always find it a little awkward to dine so close to strangers that you can hear each other's conversations clearly. I noticed that the guy in the couple looked a little familiar. We went on with our meal, starting by sharing an excellent seafood salad. I then enjoyed the Shrimp Scampi w/ Asparagus Risotto special. The shrimp were huge, not at all overcooked, and the rice was done perfectly. Husband enjoyed the Tortellini with Meatballs. By the time we finished our entrees, I was pretty sure I knew who the man next to us was and I think my husband did too, but we were "playing it cool," and trying not to look over at their table or disturb them in any way. However, while we were having an espresso, they were laughing so hard that I had to ask if I should send over a difibrulator! This led to some conversation about our favorite "Seinfeld" episodes (what they were laughing about,) Larry David, and how funny "Curb Your Enthusiasm" is. What a nice man Dennis Farina is. (And he seemed to enjoy his Chicken Vesuvio too.) So the whole "table thing" worked out pretty well in the end. Had some yummy braziole at Gennaro's recently. Their salad with anchovies and salami is a killer. they are now serving "Happy Hour Specials" (Thank You Gov. Bruce Rauner- for caving to Liquor Lobby pressures). Go from 3:30 - 6pm and Mange on $6.00 Mussels in their red sauce w/ a hunk of warm bread. Enjoy an ICE COLD Peroni, Stella Artois, or Miller for $3.00. Try a Individual Pizza for $6.00. Tell "Luke"- the bartender- I sent ya! 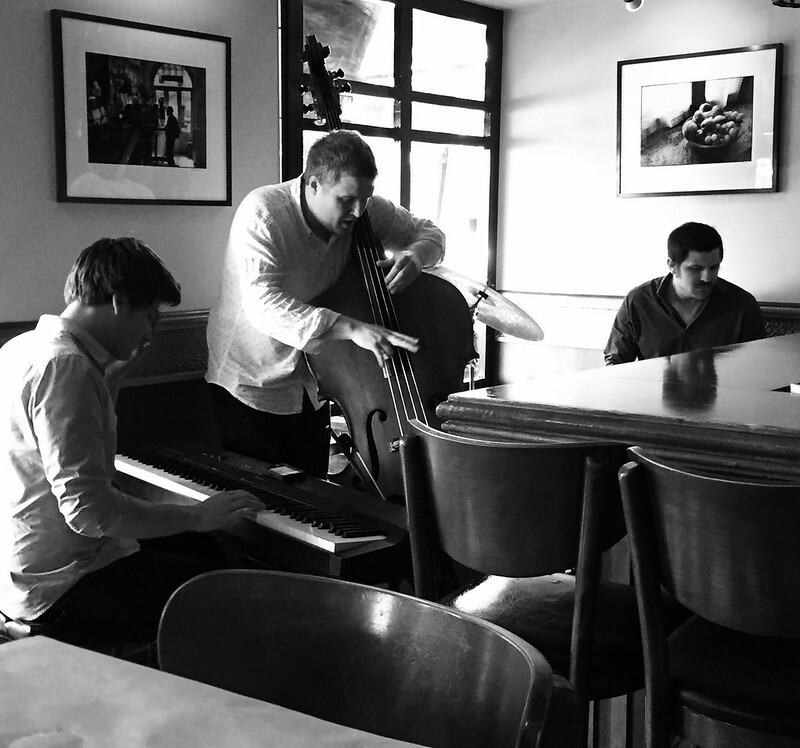 Come for the 3:30 pm -6pm Happy Hour Specials and linger longer for some swinging' Jazz! MJN wrote: Chez Joel is also a decent bistro. Great Bouillabaisse. They do it all in postage stamp of a kitchen. Very warm service. We made a return trip to Chez Joel over the weekend. We hadn't been in many years, and said "why haven't we gone lately" so we went. The meal was perfectly fine and service was OK but a bit spotty. Everything tasted as it should at a bistro. The wine list is very reasonably priced. Now, after three days, I can't really remember anything I had to eat, always a sign that maybe the place isn't memorable enough to speak to me. The room is very nice, and you could indeed be in France. For me, the meal was ruined by one of my pet peeves. The guy working the front door abandoned the post after the big dinner rush and then sat at the bar playing on his phone in front of diners for at least on hour. Dude, at least have the decency to go into the back room.